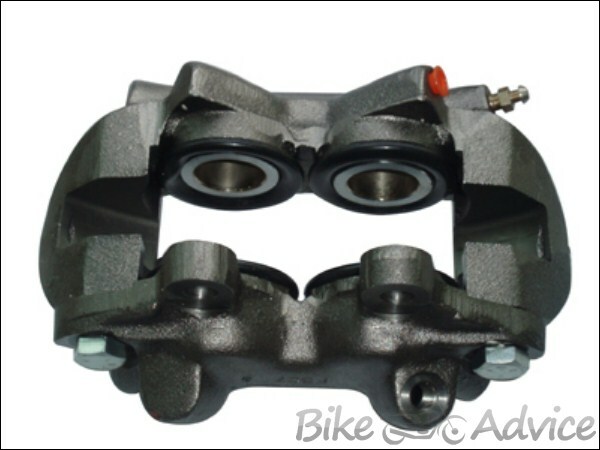 Brake caliper is the most important part of the Disc Brake Assembly. A Caliper assembly contains various fixed and moving parts. A caliper assembly is like your engine where you have piston, cylinder and other moving parts. Similarly a Caliper assembly contains Adapter, Cylinder bore, piston, piston seal, Dust boot etc. Adapter: It is also known as supporter or hanger. It is a fixed support to caliper assembly. It is bolted to steering knuckle. It takes entire braking load. Caliper: It is that part of caliper assembly which provides housing to hydraulic piston. Generally, it is made of three kinds of material cast iron, magnesium and aluminum as we have seen in type of cylinders. Depending on requirement the material of caliper can change. Cylinder bore: It is that part of caliper under which piston moves. The size and no. of cylinder bore varies according to size and no. of piston used. 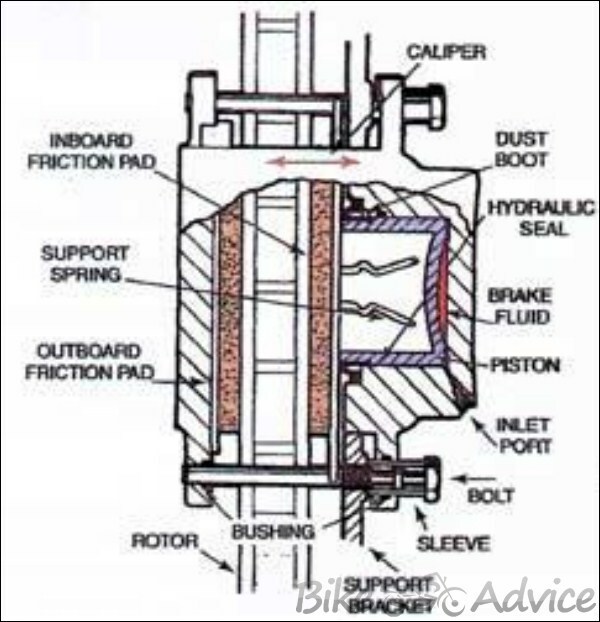 Piston: A piston pushes brake pads towards the brake disc/rotor. 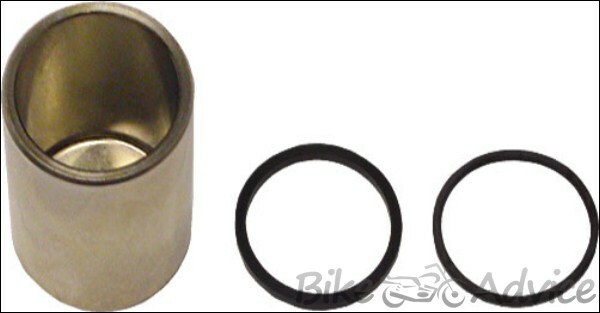 The piston size varies according to braking force needed. Similarly the no. of piston also varies depending on the type of caliper used. The braking force of one large piston is equal to braking force of two small pistons. Piston Seal: A piston seal also known as piston ring. The piston seal keeps the brake fluid behind the piston and brake pads. Dust boot: A dust boot also known as piston boot. It is placed to prevent dust and dirt going inside the cylinder bore. Pins and Bushes: The caliper is mounted on pins and Bushes. In floating caliper it helps caliper to move from side to side. Positioner: The positioner is placed between pin and bushes. It holds the caliper outward when the leaver or pedal released so that the outward brake shoe can move away from the disc. It also acts as wear indicator for brake pads. It bends and close up when brake pads worn out. Retraction Spring: it is also known as anti-rattle spring. It does the same function what return spring do in drum brake. It keeps the brake pad in contact with piston and caliper fingers. Brake pad: Brake pad plays the same role as brake liner plays in drum brake. Generally two brake pads require per brake disc/rotor. It is a wear and tear part of caliper assembly. It is made of small pieces of high friction material. The type of friction material varies as per the requirement of vehicle. 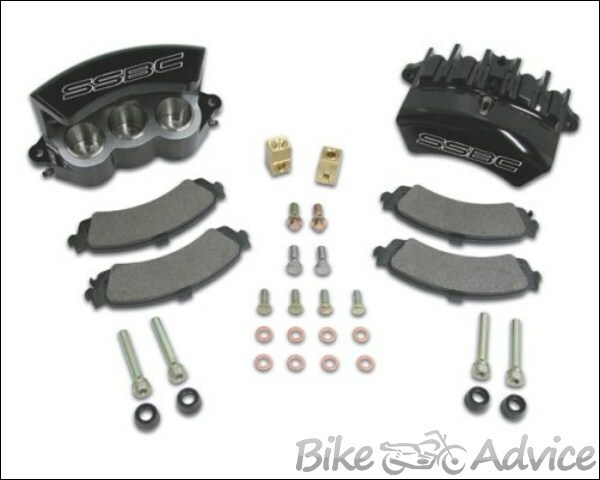 Materials which make up the brake pads include friction modifiers, powdered metal, binders and fillers. Friction modifiers such as graphite and cashew nut shells are used to alter friction coefficient. Powdered materials such as lead, zinc and brass etc. increase a material’s resistance to heat fade. Fillers are added to friction material in small quantities to accomplish specific task, such as rubber chips to reduce brake noise. You need to check the brake pad if it dues for replacement. Generally brake pad comes with wear indicator which is a small groove in between the brake pad. When this small groove is not visible, you need to replace the brake pad. It should always be replaced in pair even if only one pad is worn out. 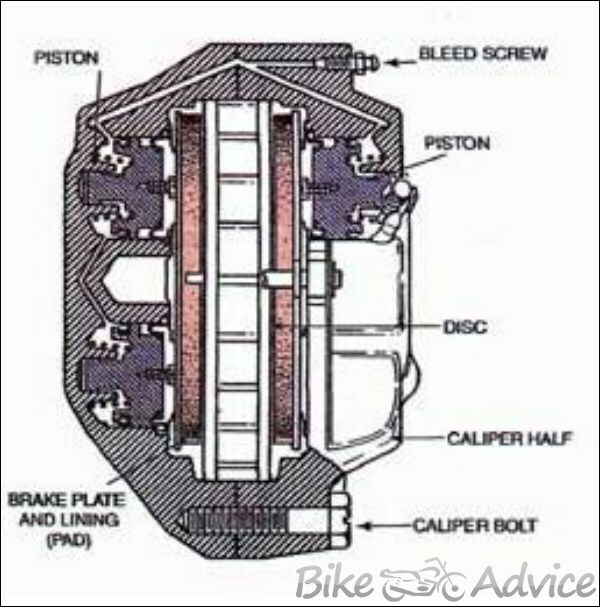 When brake lever or pedal pressed the brake fluid creates hydraulic pressure inside the cylinder bore of caliper. This pressure forces piston to move towards brake pads inside the caliper. The piston ring moves in rolling shape with the piston. This movement causes brake pads to stick with brake disc which creates friction and stops the brake disc/rotor to rotate. When the brake lever or pedal released, the piston ring pushes the piston back to cylinder bore of caliper till both piston and piston ring come into their original position. 1. Floating Caliper: It is also known as sliding caliper. As the name suggest floating or sliding caliper moves in a path within its support with respect to movement of brake disc/rotor. The floating caliper has a piston only one side. The other side it has only break pad. So the floating caliper always has combination of one piston two brake pads. The location of piston is just behind the inner brake pad. It works on the Newton’s third low of motion “To every action there is always an equal and opposite reaction.” When a brake lever is pressed, hydraulic pressure forces piston towards the inner brake pad which in turns pushes inner brake pad towards brake disc/rotor. At this moment the reaction force pushes caliper body towards the outer brake pad. In this way the caliper creates friction from both the side on brake disc/rotor. The other noticeable difference in floating caliper is that the brake fluid directly goes in to the caliper via hydraulic passage inside the caliper. Floating caliper can use 1, 2 or 3 pistons. It requires less parts compare to fixed caliper. It is less expensive to manufacture. It is easier to bleed floating caliper compare to fixed caliper. It is mostly made of cast iron or steel which in turns increases weight and heat compare to aluminum fixed caliper. A heavy weight stops the disc faster than light weight. The other advantage is that floating caliper can better dissipate heat due to sliding nature and therefore less chances of brake fade. Some loss of brake torque due to sliding of rotor. It requires more amount of brake fluid due to diameter of piston. It has lesser life and durability compare to fixed piston caliper. It is lesser stiffer than fixed caliper. It can boil up the brake fluid in case of overheating of disc. It has problem of sticking due to dirt and corrosion. As the name suggest a fixed caliper does not move with rotation of brake disc/rotor. The fixed caliper requires a fixed mounting adapter. It is rigidly mounted to the steering knuckle. The fixed caliper has pistons both the side. So it has generally combination of two pistons two brake pads. When brake lever pressed, hydraulic pressure pushes both the piston which in turn pushes both the brake pads towards the brake disc. Ultimately, the brake pads stick to the brake disc/rotor and create friction which stops the brake disc/rotor to move. The fixed caliper mechanism creates equal pressure from each side. In fixed caliper the brake fluid is rooted through crossover lines or steel tubing which is placed outside caliper housing. They are directed in to caliper halves with sealed O rings. A fixed caliper may have 2, 4, 6 or 8 pistons depending on the requirement of vehicle. There is three pistons fixed caliper also there which has two small pistons on the one side and one big piston on the other side. There is no loss of braking torque due to sliding as fixed caliper does not move. It does not have problem of sticking as it is made of aluminum which is less prone to rust and corrosion. It is stiffer than floating caliper. It has better life and durability compare to floating caliper. The use of fixed caliper is limited to luxury and high performance vehicle. Fixed caliper requires more effort to bleed than floating caliper. Fas Question: First Disk brake application in India. 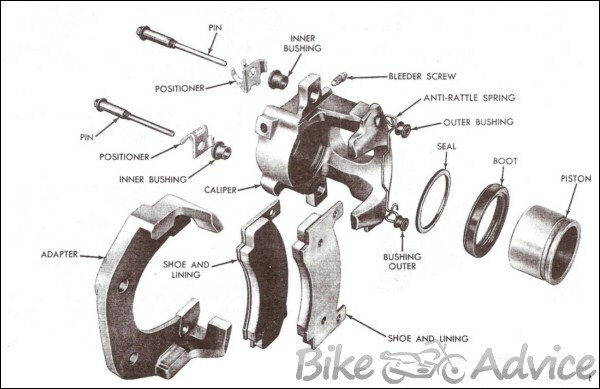 Answer: As far as i know First Disk brake application in India was found on Royal Enfield Fury motorcycle. 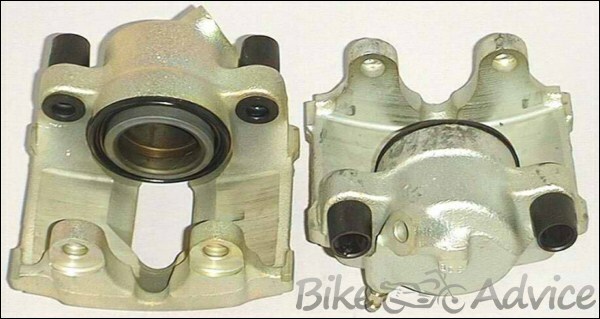 Royal Enfield was the first company that started trend of Disc (hydraulic) brake in India.